The iRobot Looj 330 is yet another major step forward in the relentless march of robotic evolution. No longer are robots confined to dismantling bombs and trying to kill Will Smith. They now occupy numerous niches in the home market, and the iRobot Looj 330 Gutter Cleaning robot is latest design to come out that makes our lives easier and safer. 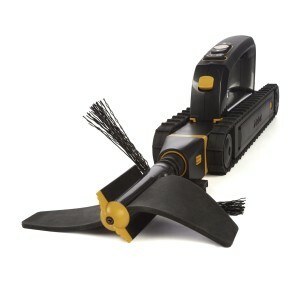 It’s not hard to guess from its name what the iRobot Looj 330 Gutter Cleaning Robot does – it cleans gutters. And to its credit, it does the job well. It not only takes over a difficult and labor intensive chore, but it also makes the chore safer since it reduces the time you spend perched on a ladder. 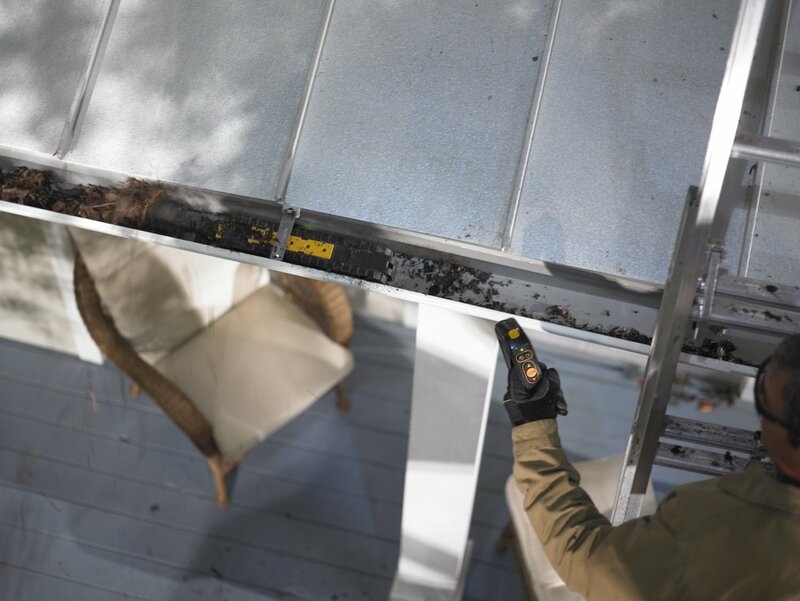 Cleaning the gutters with an iRobot Looj now involves just a handful of trips up the ladder, instead of repositioning the ladder every few feet so you can dig the gunk out with your hands. The robot itself is incredibly easy to operate, and once it has been placed in the gutter it removes leafs, dirt and just about anything else it encounters – with the possible exception of that squirrel that chose your gutter as its final resting place. The iRobot Looj works by breaking through the debris in your gutter with its powerful, high-velocity, four stage augur. First the augur breaks through the debris, which is then ejected from the gutter. Then the sweepers brush the trough, and finally a scraper gets the last stubborn layer of grime on your gutters. The robot is completely autonomous and all that you have to do it hit the “clean” button. Of course the remote control does give you a measure of control over the robot, and you can move it forward or backwards if it you need to. It also allows you to decide what direction it ejects the waste in, so that you’re not just sending the waste back onto your roof. Another feature of the iRobot Looj 330 is that it is waterproof. So you don’t need to worry about sending it into wet environments, or more importantly – spraying it down after it’s crawled through a seasons worth of grime in your gutters. It also comes with a belt clip, so you don’t have to worry about trying to hold onto it while lugging it up onto your roof. The robot itself isn’t overly heavy robot, and boasts a compact design at just under 2 inches high and 3 inches wide that allows it to fit most standard gutters. I ordered the iRobot Looj 330 Gutter Cleaning Robot from Amazon, happy in the thought that I could cross yet another chore of my to do list. The inside of my house already has an iRobot 380t Floor Scrubbing Robot and an iRobot Roomba 880 Vaccuum roaming around, so it was time to automate some of my outdoor chores. After receiving the robot, and fully charging it, it was time to put it through its paces. The timing of this review couldn’t have been better, since spring thaw had just finished. I live on a well shaded lot – which is great in the summer, but provides a backbreaking amount of leaves in the fall. So needless to say that even with my best efforts last year, my gutters were in rough shape. The design of the robot makes it easy to haul up a ladder – even when you’re in a two storey house like I am. Once the robot is placed in the gutter, it’s as simple as making sure that it’s aligned properly, and off it goes, cleaning and drilling through the gutters. After hitting the clean button, the iRobot Looj 330 Gutter Cleaning Robot started drilling its way down my gutters like some sort of sci-fi subterranean vehicle. Debris started raining down from the roof and within moments it was down to almost bare metal in the gutters. After allowing it to go the length of the gutter, it should be mentioned that it did encounter a few problems. First of all the robot did become hung up once, and started to flip itself over. It was easily corrected, but it’s hard to tell if this was a one time issue of perhaps something that could be a regular issue. Another minor issue was that in certain locations it left about half an inch of debris. So I did have to go back manually several times until it was totally cleaned out. That seems to be more in line with how it functions though, and you shouldn’t expect a perfect cleaning on the first pass – especially if you have very dirty gutters. Beyond that though, I was pleased with the operation of the unit. It can be difficult at the best of time to clean out my houses gutters, and this allowed me to do it without risking life or limb. It still requires some work as you have to be up the ladder with it, and it does have to be repositioned each time you move to a new gutter. But overall it’s a huge improvement in the cleaning process, and I would recommend it to anyone that afford one. The iRobot Looj 330 is another solid unit from the iRobot Company. While the operation isn’t as flawless as some of their indoor units, it does have a much more difficult and dirty job to do. If you’re willing to overlook some minor flaws, then this is a great unit to own. Click here to read more reviews at Amazon.com . For our Canadian readers, you can find the iRobot Looj 330 Gutter Cleaning Robot at Amazon.ca .